Once again, we are well into another unpredictable year. Winter went straight to summer in some areas. Heavy rainfalls followed by weeks of drought have occurred. Working to provide the best inputs to help turf remain healthy is on the top of our minds. Water management is a key to overall turf and soil health. Managing the heavy rain, attempting to move it off the surface and get it where you want is a goal. Then as rainfall subsides and irrigation becomes the only source of water, we start seeing Localized Dry Spots (LDS). These dry spots are usually, but not always, on humps and undulations or compacted traffic areas. Soil types play a significant role in how water both moves into the profile as well as how it is retained. Sandy soils usually have better infiltration rates, while clay soils are slower. Sandy soils have less water holding capacity, while clay soils have more micro-pores that can help maintain soil moisture if the water can be moved into that small pore space. Soil surfactants, or wetting agents, have become a standard tool with turf managers. Soil surfactant chemistries are primarily broken down into two categories: infiltration and hydration. Infiltration products are products that provide better water penetration into the soil. They can help overcome barriers such as thatch, high organic matter, layering and even compaction. Infiltration products also help soak water into the soil where it hits instead of running off high spots and slopes. Hydration products treat the soil to improve volumetric water content. They help overcome LDS and keep more consistent soil moisture content. Hydration products improve irrigation efficiency and may be critical during times of drought and high water needs for the turf. Precision Laboratories, LLC has two infiltration specific products – Duplex™ and Alypso™ Plus. Duplex has been used for several years as a proven penetrant and the newer Alypso Plus is an even stronger soil penetrant. Both Duplex and Alypso Plus contain acids that also help move water in as well as aid in dealing with bicarbonate in the irrigation water and the spray tank. Both of these products can be tank mixed with most pesticides. They will act as a foliar surfactant for tank mix partners and then when watered in will perform as a soil surfactant. Both the pH of the spray tank and soil pH can be improved. Additionally, Precision Laboratories is best known for Cascade Plus™ wetting agent. Cascade Plus is still a foundation product used by many as both a hydration and infiltration product. Recently, Precision Laboratories introduced two newer chemistries – Vivax™ and Triplo™. These products have combinations of both hydration and infiltration ingredients. Vivax has a higher level of hydration chemistry with infiltration chemistry added. It has become a strong competitor as satisfied users share their successes in managing LDS while keeping the surface firm. Vivax does not have to be watered in right away, therefore, it can be tank mixed with foliar products and allowed to dry on the leaf. It is recommended that Vivax applications be watered with 0.20- 0.25 inches of water sometime during the same day as application. Vivax is available as liquid, granular or tablet form. Triplo has a higher level of infiltration with hydration chemistry added. It will push water even deeper and is a great choice for native clay soils to get water off the surface and help move it into the smaller pore spaces. Triplo has also been used on sandier soils where more penetration is desired. 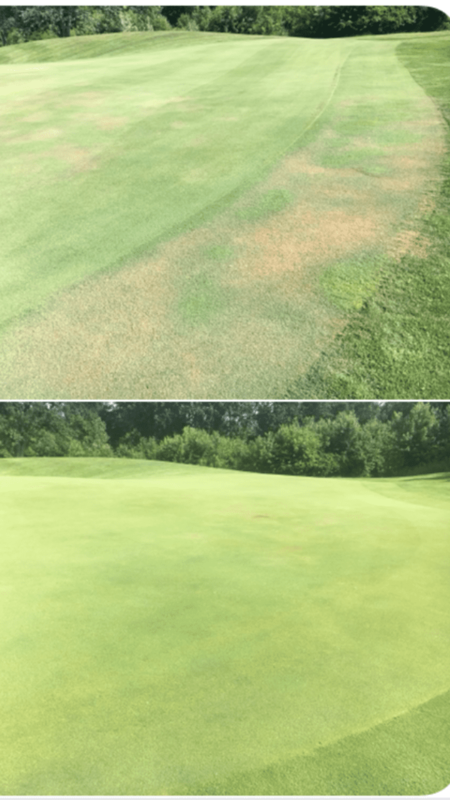 Before and after photo of Triplo helping a green recover in 1 week. The products mentioned above work very well on their own in most situations. Your Advanced Turf Solutions rep can recommend which product would best meet your needs. These products can be used in a rotation or can even be tank mixed to dial in performance based on soils, weather and your specific needs.